Clip It! - Silent "e"
This unit contains 56 silent “e” cards (28 CVCe cards; 12 CCVCe cards and 16 CVC cards). 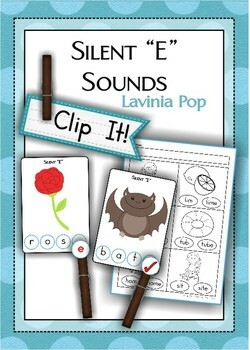 The aim of this activity is for children to read the words at the bottom of each card and identify whether it needs a “silent e” peg to make the vowel say its long sound, or whether it has been correctly written, in which case they attach a “tick” peg on to the circle at the end. 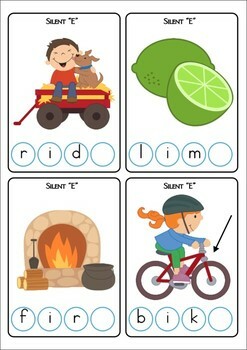 If you don’t wish to use pegs, children can use dry-erase markers to write the silent e or tick. I have included 10 follow up worksheets that can also be used independently from this activity. 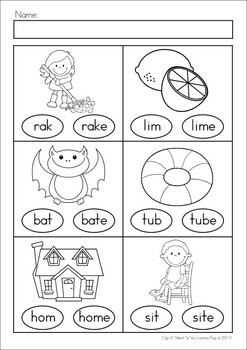 The worksheets can be completed with dot-paints or children can simply color the circle to show the answer.